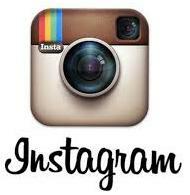 Feedback: 8 comments - leave yours! The Italians love their pasta so much they bombard it with loving names. Stuffed pasta has so many names even the locals have lost track. The ones we make today are named agnolotti (little lambs) but you could equally call them ravioloni, tortelli or just raviolis. 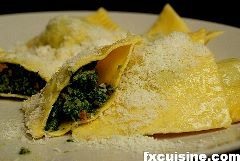 As you see, it is a magical moment when you make your first raviolis from scratch. We start by flavoring the meat. In a large pot with a heavy bottom heat a couple tbsp oil on maximum and add both meats. 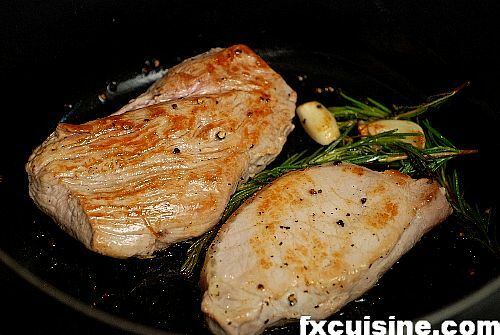 Brown on all faces to develop the taste, then add the garlic and rosemary, add a glass of water or white wine cover and reduce the heat until the meat is cooked through. Then remove and chop in large cubes. Discard the rosemary. 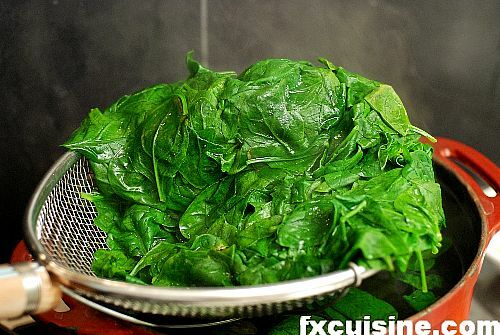 Pick, clean and stem the spinach leaves, then quickly blanch them until soft. 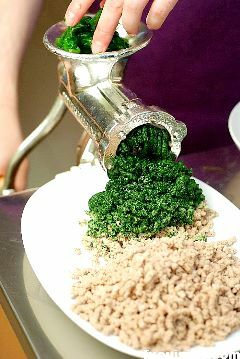 Grind both meats and the spinach through a meat grinder. Here my mighty Porkert grinder from Dehillerin in Paris. 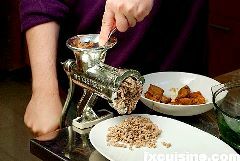 I would not use a mixer as this would destroy the structure of the meats. 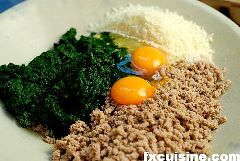 In a large bowl combine the ground meat with the spinach, a cup of grated parmesan and 2 eggs. Season with salt, pepper and nutmeg. I have made a very good second batch with the same stuffing plus roasted walnuts and bacon. 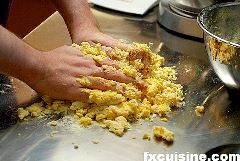 Prepare 6 eggs' worth of pasta dough in the usual manner, that is make a small volcano with the flour (about 100gr per egg), add the eggs in the center and combine. 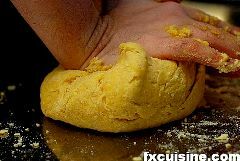 Then knead until you have a smooth texture, wrap in foil and let rest in the fridge for 30 minutes. It is best to prepare the pasta once the stuffing is ready as it can dry out otherwise while the stuffing only improves with the waiting. 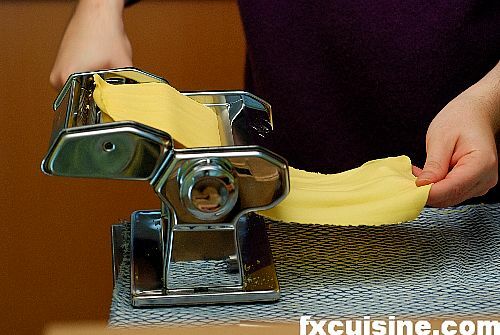 I recommend using one of these small pasta machines Italians call "macchinetta" to laminate apricot-sized chunks of pasta dough. 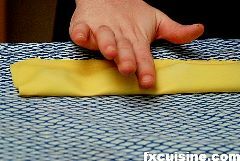 Pass the pass each pasta sheet many times through the machine until the texture is smooth, uniform and silky. Fold in half every time. 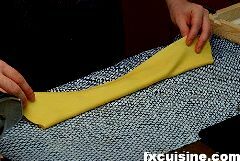 Reserve the pasta sheets on a dry cloth or a mesh. And now for our most cinematic moment. 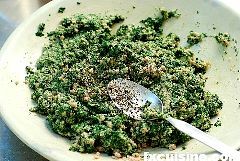 Spread a sheet of pasta on a cloth and garnish it with spoonfuls of stuffing like if a green bird had pooped over it. 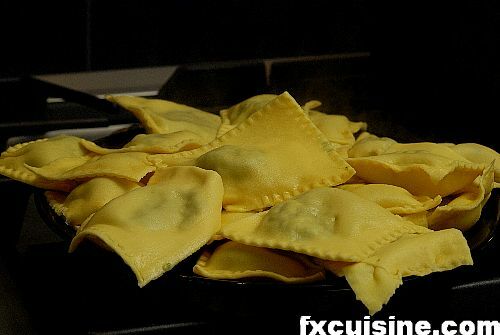 Do not get carried away and use too much stuffing or your raviolis will break open. 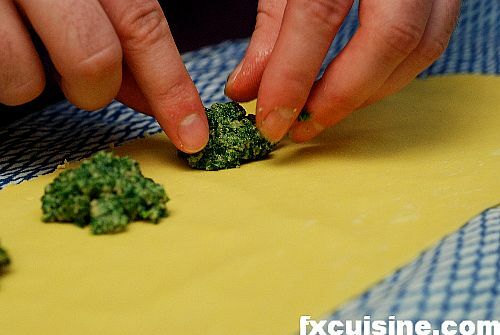 Fold in half and gently lay your fingers between each ball of stuffing so that the top pasta sheet touches the bottom one. 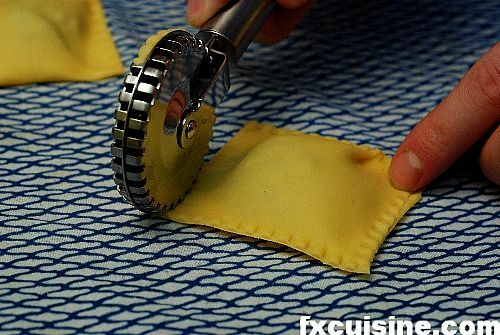 Using a rolling cutter, if possible one designed for this specific job, cut each ravioli out startin by the long sides. The idea is to separate the raviolis and seal the contents at the same time. You could do this with your fingers and a fork. 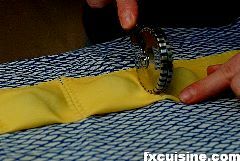 Finish each raviolo (uh, that's singular for ravioli) with the cutter so that you get a uniform serrated border on all sides. Reserve them on a dry cloth or on a mesh rack. Fill your largest pot with water, salt and bring to a rolling boil on your hottest burner. Briefly cook the pasta. 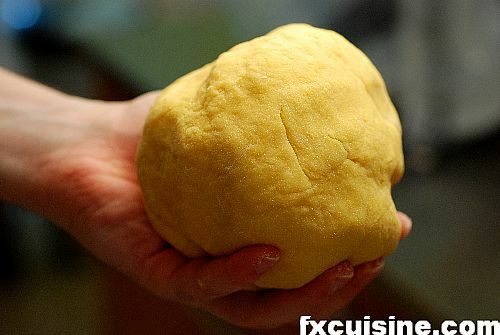 It might require only a minute or so although al dente is not so vital in fresh pasta as it is with dried macaronis. 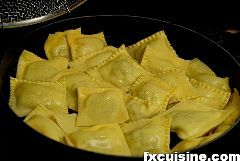 If, like me, you were careless and trapped in a little air, your raviolis will remain on the surface throughout the cooking. If so, move them about to ensure even cooking. 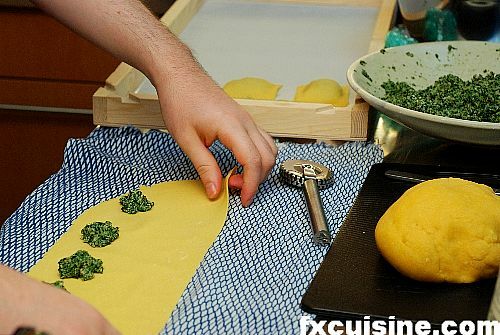 A wonderful success that will bring you back in your kitchen to make more stuffed pasta! 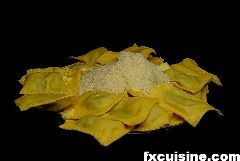 I found this recipe in the ravioli bible published by Slow Food Publishers, Ricette di sua maestà il raviolo (Recipes From His Majesty the Ravioli), BRUNI Luigino, Slow Food Editore, 1993. It is a very detailed cookbook that explores ravioli traditions and history for the most authentic Italian cooking you can find. Warmly recommended even if you don't speak Italian! 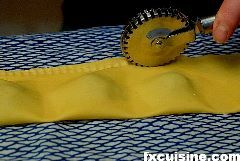 where can I find store bought pasta sheets? FX's answer→ I am not sure this exists Nancy. 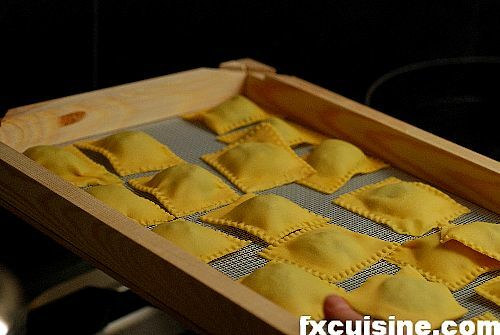 Much better to buy yourself a little pasta machine, you can make much better pasta sheets in a few minutes. 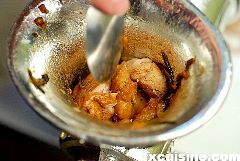 Estupenda receta y estupendo este sitio. it's interesting that in this picture your pasta is yellow, while in your lasagne one it is beige. did you use different eggs in each of them? the pastas in bologna were always dark yellow because the yolks of eggs there are orange. here in the u.s the yolks are pale yellow. incidentally I have never had pasta as good as in Bologna. Do you think the egg is the big difference on why the pasta is so good there. Another interesting phenomena I noticed about the pasta from Bologna is that the pastas little have raised bumps all over them. This is not something I ever encounter over here in Los Angeles. Gracias por esta deliciosa receta!!! Mile gratzie!!! Mis felicitaciones por el gran detalle de explicar al 100 % esta receta; la que me parece realmente extraordinaria y de gran calidad; me he trasportado a Italia por unos instantes al hacerla, me salio de maravilla, ya la copié para la posteridad. Muchas gracias y mi gratitud eterna por este gesto tan noble dde dar esta receta sin reservas.